This historic market in the heart of Soho is known for traditional fruit and veg stalls and loads of street food. 300-year-old market and the vital ingredient in the magical Soho recipe. Traditionally fruit and veg and the birthplace of pineapple and nylon, now fighting for its independence in the face of development and gentrification. Good things are happening here, come see, talk, eat, enjoy. We use this market every day it is open, you can get just about everything you need there apart from a drink! One of a kind in central London.We want to retain it,and have it restored to it's former glory. such an important part of the history of Soho. and for the hungry droves of media bods looking for the best deal at the best price every lunch time. This has been a great market for years. Over the last decade, there has been even more variety and innovation! Keep it up! Authentic, diverse, affordable, friendly, lively people's market! The jewel of the area. There so much choice and quality. I love Berwick Street market and want it to remain independent. I have always loved Berwick Street Market - for the wonderful stalls, fabric shops and cheeky chappies - this great market in the middle of Soho. It gives Soho grit, colour and vitality. It would be a very very sad day if it disappeared. 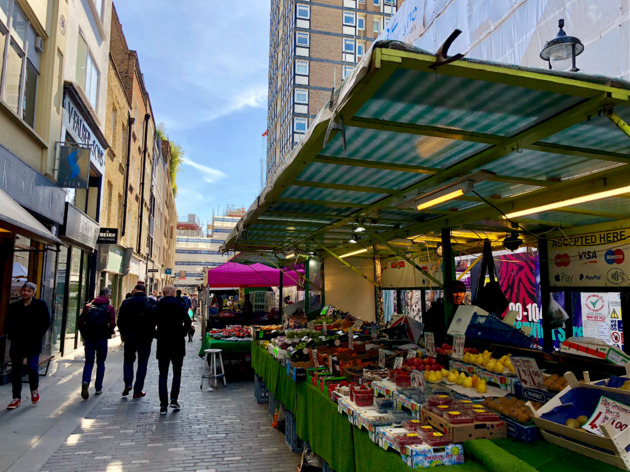 In the heart of SoHo is the fabulous and thriving Berwick Street market. With a rich mix of independent stalls selling fruit & veg, flowers, milk, coffees, fabric, homewares, plus a plethora of food stalls makes this market a must-see and repeat-visit place. It's USP is its independence and timeless charm and its distinctiveness from other nearby streets and its near-neighbour Carnaby Street. Like the people on the market! Love the energy on the market! The buzz and history of Soho all come together in this shamefully wonderful street. markets define an area and are sighted very particularly. 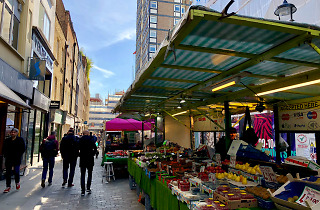 it would be criminal to not have a market in the middle of Soho as it gives a community a structure and a bonhomie that would be sorely missed were it to cease to be. Berwick Street Market keeps a spirit of Soho alive like nothing else. Filled to the brim with amazing produce and delicious food! Who can resist a £5 mega falafel from jerusalem falafel?! The food is amazing! The community feel is so wonderful. We hope it is not privatised! its an institution that needs to be saved - fresh produce, independent stall holders, great for tourists and locals, not generic and formulaic. Its always been and needs to carry on, with more stalls encouraged to take up residence. One of the few remaining original inner London markets. Full of character with wide ranging offerings from cheap clothes to quality fruit and veg attracting well known chefs from near and far. Great independant traders and a stalwart of Soho for many years.... dont let it be swept away like the rest of Soho! This iconic place has served Soho residents and workers and tourists alike for decades. It is the essence of Soho in the truest sense . Berwick Street Market is the old beating heart of Soho. Great selection of shops, stalls, food, fabrics. Wonderful atmosphere and a place I have visited and shopped in since first discovering Soho as a teenager in the 80s. I started my working life back in 1979 as a market trader in Berwick Street, selling fancy goods and 9 ct gold jewellery when I was just 16, it gave me the platform I Needed to grow as an idividual. A beautiful, slightly grubby mixture of stalls and cafes, one of the best comic shops and some of the best and most historic haberdashers in London. It is one of the few remaining bits of old Soho - a major artery - and must be guarded against rapacious developers looking to rip the heart out of the area. The market is more than part of the neighbourhood; it is the neighbourhood!!! One of the best street markets in central London - long-established and offering reliably good quality at very fair prices. Berwick Street Market is 300 years old and is fighting back against demolition, development , gentrification and privatisation. The spirit of this place is unmatched. It deserves recognition as real Soho treasure and the engine of the Soho conversation. I want my vote to count for something as vital as this market place at this time - an historic moment in the life of independent, creative, authentic Soho. The last remaining bit a of true Soho (although the council is currently trying to close it!). Traditional fruit and veg stalls along with other market staples and some great food stalls. Hope it survives the current gentrification that's ruining the heart of Soho. No matter where you work or what you’re doing in Soho, a walk on over to Berwick Street market is definitely worth it. It might not be the quickest lunch you’ll have - I once waited 20 minutes for a spanish tortilla but just you try and stop me queueing up again for it - it was well worth the wait! The falafel stand is also a hit and thankfully the queue goes a lot quicker, those guys have that wrap construction down to a fine art! Worth visiting just for the parma ham and mozzarella sandwich stall. It's right at the end and rarely busy. There's occasionally a cake stand who do the best brownies, even if they do cost £3.50 each. The vibe is great here but unfortunately the Friday I went the Savage Salads weren't there or maybe they had sold out already and I missed them?! Will be back again as the overall variety and choices are great. Highly recommend Savage Salads lunch boxes, normally there on Thursday/Friday, expect to queue, especially in the summer but great value and delicious.